Tyler announced his plan to kill off Madea during an interview on Sirius XM radio. He said he filmed Madea's funeral 2 years ago, and he's finally able to let her go. The actor, director and playwright said he will hold Madea's funeral next year to allow her fans time to mourn her passing. He didn't say how he plans to end Madea's life. Madea is a lawless senior citizen with unhealthy eating and lifestyle habits. She had a lengthy criminal record dating back to age 9 that included charges for assault with a deadly weapon, attempted murder and vehicle theft. Plus, Tyler said he didn't want to grow older than his famous character, who is 87. "I just don't want to be her age playing her," said Tyler, who at 49 is still a relatively young man. It will be 20 years since Tyler donned a dress, wig, padding, and makeup to play his signature character on stage. The final film franchise, featuring Madea's funeral, will open in theaters in 2019. I understand why he’s doing this, but I don’t think this is going to fare well with die hard Madea fan base. I’m still curious as to what Tyler baby mama and baby look like.?????? He’s kept them hidden very well. As for Tyler -- it's way pass time. Put a woman in a Madea. He has grown as an artist I doubt this will not affect his career and production company. Not all actors want to be type caste and i applaud him for his courage to grow beyond this character . damn ! i thought ol Tyler was dead? Tyler Pleas don't that's not a good Ending at all..
you go there, to visit and make a Movie about her Living the Life after Retirement. From what the sister says it was for a free trip to LA. The mom and daughter both need crazy checks smh. He may kill her off in a movie, but he'll still dress up as her at home.
? He borrowed one of his wife's prosthetic butts. her, and write more scripts off that. WAS JUST talking about this. Sandra you in our Groupme chatbox? You be spying on us? HUH? Anyways I kinda seen this coming. He is ready to be rid of her bc he is doing different stuff. And really the addition of Madea in A LOT of the movies is a sub plot that could have been avoided. The Taraji/Gladys/Mary J movie. Madea didnt have to make an appearance in that one. Some others too. "It will be 20 years since Tyler donned a dress, wig, padding, and makeup to play his signature character on stage." Madea should have been killed off 20 years ago. *His ays still aint believable as Alex Cross tho. Whether Madea is dead or not. My niece is 5 and TP can be himself and she will say, he looks like Madea. Boo! ? Black Twitter would be in an uproar if Tyler died. He’ll end up filming Madea Goes to Heaven? (Yep, you gotta was add a question mark) co-starring Cardi B and Nicki Minaj instead. Listen, I love the Alex Cross series, but seeing him in the role was a huge disappointment. Soon as they announced he was playing Alex, I was like ??. I loved Matthew Fox in it though. You better send her off right! Brown betta sang at that fune!!!! We saw that trailer originally in a movie as a preview. My oldest said she kept waiting for him to break out with "Heller how yer derin" dressed as Madea at any moment??? I knew it! Everything about that story seemed contrived. I was wondering when Tyler was going to get tired of wearing those ugly dresses and that wig. Dr Phil is a reality show so all his guests are fake. You mean put her in an adult daycare or assisted living facility? With dress changes like Aretha. About time. In fact ALL black men cross dressing under the guise of comedy - but for real they feel comfortable rocking a dress and a wig - needs to dead all of those characters. So how is he gonna continue to do comedy movies without Madea?...Will all his movies be serious filled with drama from now on?.... Cuz he's not funny without her! Good, now go kill that over done black black blackity black dye job on his beard and head scalp...let's kill 2 birds with 1 stone..PUHLEASE. Right! And its pure torture trying to watch him play a straight man. He shud never act in his own films unless its as madea. The why did i get married movies were good except for the pain of watching him pretend to be interested in his "wife"
It will all be a dream. Madea will wake up and realize that she ain't dead and then come downstairs and one of her 82 grandkids from her 33 kids (cause she got a different family (besides Cora) in every movie) will be at the table. He also had a hand in Kerry Washington’s film “Meet the Peeples”, which I thought was really funny. I think Tyler can create some good projects he just needs to let some quality people write, direct, and produce. Equivalent to killing his career, Madea films are the only fims i like from him. TV shows i dont like. This is another publicity stunt so trust and believe he will resurrect Madea aftet numerous failed movies without Madea. Madea films are only interesting because of her. I think she was like a Trojan horse used to deciminate his overly moral and religious undertones. Without Madea it’s just a bunch of black people trying to lecture you on how to be a productive member of society - or how not to be abused/r@ped/etc. I was done with Madea when she went to jail lol and I haven’t looked back since lol. I have enjoyed his other films (“Why Did I Get Married” & the sequel - “Meet The Peeples”), so hopefully he’ll be focused on producing more quality films. Thank the Lordt and all of his saints!!! Shiiiid, he better hope Madea don’t kill him first. She don’t need him. She can get someone else to produce movies around her character. He'll just do a "Madea's Ain't Dead!" movie in a year or two. Not getting my hopes up! Yeah, but [they] got different reasons for that"
I have every play and every movie she's in. Comical as hail. She makes them honestly. I will be sad to see her go. I don't know if Ty is gonna be able to cope with killing her off tho. He seems so at peace when he plays her. He better think long and hard about killing Madea. She is the glue in his dynasty. Too bad I wasn't fortunate enough to work with her. Tyler was on the View this morning. He's so humble, generous & smart. Love him ? That damn costume is spot on ??? Like Madea in real life. Madea needs a to be a grandmother if possible a great grand mother before she passed. What happen to have daughter Coral? Right! Why announce he’s going to kill her off?? Need time to mourn? He think folk gon commit suicide if he just kill her off?? He can't do it...not for long. Madea is his moneymaker. People love her. 2022.."Madea returns from the D3ad". Just like a cheating husband...she won't be gone long. Exactly. Parts 1 & 2. That's the only thing I'll watch. Lol I threw in the towel on those soap operas. Get it Tyler! I had no idea he was only 49. I take issue with how he portrays some of his black female characters but I have so much respect for this man and what he's accomplished. But please don't kill off Madea. She's my favorite character. Love her. What happened to Madea goes to Wakanda? And I bet she's gonna make appearances in people's dreams just like the grandma on Soul Food. I'm just amazed that Madea's lacefront looks better than what I see on celebrities and reality tv stars. Am I the only one that has noticed this? 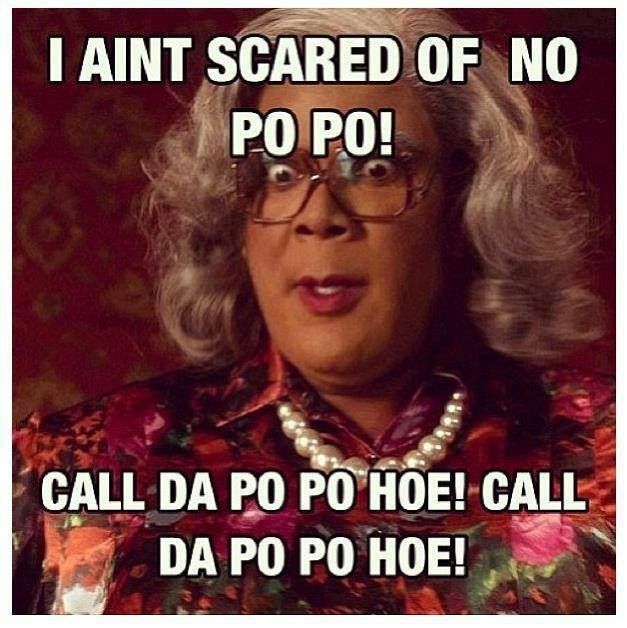 I like Tyler Perry and I love Madea's character. That damn character is funny as all hell, mayne. i'm going to miss that character but I love Tyler! U really need to call him. Nah, don't take it personal. It's all fun. She good people...Some people do too much. She's not one of them. Well how else will he know how we really feel? He once said that as long as people wanted to see her, he would do her. I think people could deal with her marrying a Saudi prince, taking a lonng vacation and then k1lling him like some of her husbands...but not being completely d3ad. Gee, that was a mean thing to say. I try to be authentic & genuine at all times. Just here to enjoy the conversation. I'm a nice person who likes to laugh and make others have fun too. Thank you for your kind words, Mz_O. You didn't have to say anything. I appreciate your spirit. It's not many people I enjoy on this board. For some odd reason. You make me laugh. And I enjoy that. I don't think you're mean spirited at all. Realistically, the Madea character does need to die off or be revamped. She's of a generation that is already dying or dead. 20 years from now, Black grandmas won't be like the Madea character. She will be a relic of the past. Grandma's will be EXACTLY who Madea is 20 years from now. LOL Cussing out the police, smoking weed, talking $hit.. she IS this generation.